Last weekend, we went on a snow tubing trip along with our friends at Tuxedo, NY as an outing for the kids. We brought food from home, and our contribution was this cake. This is my favorite cake, and I just had several slices over the weekend. For this very reason, my wife doesn’t bake them often. It is also a family favorite when they visit us from India. My wife obtained the original recipe by Deborah Mele (God bless her for this recipe) at Italianfoodforever.com way back in 2003 and has baked it over a dozen times over the years. A few changes have been made to the original recipe to suit our palates, and also based on the ingredients we have or don’t have at the time of baking. 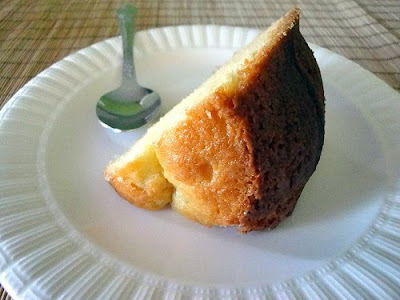 The result is a moist and rich cake with orange flavor that just melts in your mouth. The recipe listed below is the modified version and the link on top of this post will take you to the original recipe, after a few clicks (please follow directions when you link). The original recipe uses lemon juice and flavor, whereas we used orange juice and orange zest. I say ‘we’ here since all three of us – my wife Anita, my four year old daughter Tvisha, and I – all participated in the preparation of this cake. Apart from using orange juice and zest, we used mild tasting olive oil instead of extra virgin olive oil, and only 2 cups of sugar since we wanted the cake to have a balanced taste rather than being a little too sweet. We didn’t sprinkle the cake in the end with powdered sugar. Pre heat oven to 350 degrees F. In a large bowl, mix together the eggs and the sugar and blend well. Add the oil, milk, orange juice and zest and mix well. In a separate bowl mix together the flour, baking powder, baking soda and salt. Add this mixture to the eggs, and stir until just blended. Pour into a Bundt cake pan sprayed with cooking spray. Bake for about one hour, until a pick inserted into the cake comes out clean. Cool and remove from the pan. Serve. In my opinion, this cake tastes exquisite along with some perfectly brewed fresh coffee. Ingredient Substitute/s: You can replace the orange with pineapple juice and minced pineapple chunks, or ripe mango pieces and mango pulp. Or simply vanilla essence with some roasted walnuts would do wonders to this cake. For one of our parties, my wife wanted to make an apple pie. We had just bought Pillsbury refrigerated pie crusts and she couldn't wait to get started. We followed the recipe from the Pillsbury website to the dot. The first attempt turned out to be nice, and everyone enjoyed it. Pre heat the oven to 450 degrees. Place 1 pie crust in an ungreased 9-inch pie plate and press firmly against side and bottom. In large bowl, mix the apples with the sugar, spices and other dry ingredients. 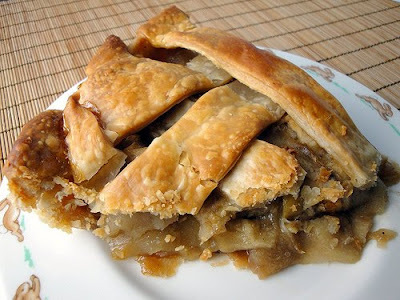 Fill this into the crust lined pie, and sprinkle the butter on top of the apples . Cover with the second crust in an alternate criss cross pattern (our experience with the crust which we tried to roll out wasn't that great with the crust sticking and not rolling out properly. Not to worry. Just form the crust into a dough ball and roll out into a thin crust again and continue). Serve warm with vanilla ice cream and candied nuts, or drizzle caramel and chocolate, any which way you love it. Perfecto! Mushrooms and peas were the order of the night, and it turned out to be perfect for the kind of battering we are getting from the snow. I wanted something spicy to at least make me forget the cold for a while. I ended up making this quickly, and it knocked quite a punch with the spiciness from the chilis, and the pesto and other spices blending beautifully. Once all the ingredients are ready as stated above, take a deep skillet or a wok, and on medium heat add the oil. When the oil is hot add the chilis (be careful as it will splatter a lot), turmeric powder and coriander powder and saute for a few seconds. Add the peas, mushrooms, salt to taste and saute until the mushrooms are nicely roasted, with all their moisture evaporated. Add the tomatoes and continue to cook on medium heat until everything is well cooked. Mix the pesto paste (2 tbsp if you have pesto sauce) with the cooked vegetables and saute for a few minutes more before turning the fire off. Garnish with fresh chopped coriander leaves and serve hot. This can be had with rice, chapati or tortillas. This would also be great in a wrap with some grated cheese added to it. Say what? A wings recipe from me as well before super bowl?? No no, not today..I'll do that on a different day. Instead I thought of posting the recipe for a great accompaniment, something that would at least lighten the guilt for you, after you have rummaged through 30 - 40 wings cheering your favorite team :-). A fantastic salad!. You got to try this salad, period; and the super bowl is a perfect occasion for that, for the vegans and vegetarians and everybody else. As I was on one of my not so regular evening walks during last summer, I had the Beatles Rubber Soul playing on my iPod. I was listening to this album after ages and couldn't help starting to sing out aloud with it as I walked around my housing complex. I was in such a good mood due to this that I started thinking about food of course. This moment inspired me to come up with this salad recipe that I am going to share with you. As the ingredients for the salad started flowing into my mind, I came back home and immediately wrote the recipe down in my diary. I finally got to try it out a few days ago, and it needed no tweaking whatsoever and came about just as I had imagined it would taste. One of my favorites now. Have all the ingredients ready before preparing the salad. Chop a medium sized fresh fennel root into small pieces (1/3 inch size), 1 1/2 cups in total. Cut the pineapple chunks into similar size pieces, 1/2 cup in total. Make sure to use the can of pineapple chunks that comes with pineapple juice and not heavy or light syrup. Cut one large jalapeno pepper (after removing the seeds) into thin 1/2 inch size pieces. After seeding the orange bell pepper, cut into long 1/4 inch thick slices and set aside. In a non stick pan, on medium heat, add 1 tbsp olive oil and 1/2 tsp coarsely crushed cumin seeds (not powder). When the cumin seeds begin to crackle, add the orange bell peppers and roast them until golden brown. Turn off the flame. 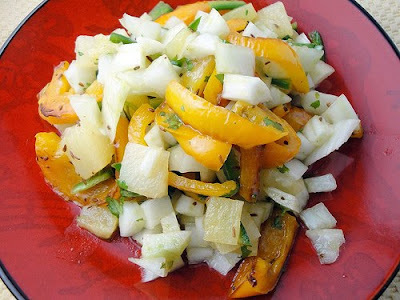 In a large salad bowl, mix the fennel, jalapeno peppers, pineapple pieces, roasted orange bell peppers and cumin seeds, freshly chopped coriander leaves, pineapple juice, lemon juice, salt to taste and mix well together. Serve immediately. Each ingredient in this salad stands out prominently, rendering a lip smacking taste. For me, the roasted orange bell pepper with its sweetness combined with the lemon and pineapple juice made it taste almost tasted like mango. Serve fresh at room temperature or cold. Note: If you don't get orange bell pepper where you live, you can use red bell pepper instead, as you need a pepper on the sweeter side. I have prepared this dish twice in the near past, and wanted to tweak it until I was satisfied it was ready for posting. This is my take on Butter Paneer, one of the most popular Indian dishes. Right off the bat, I would like to say that this is not for the faint hearted, and I prepare this dish only once in a while for special occasions. If this were to be cooked very regularly then I might as well be writing my blog from atop my elliptical machine. I like this dish and make it especially for my wife who adores it and anything with paneer, but doesn't get to eat much of it. This north Indian dish is on the menu of any Indian restaurant you walk into. Although most ingredients are the same there will be some variations. Personally I don't prefer the use of cashew nut paste (used by most) as it makes this already rich dish richer and creamier. I like to let the other flavors and ingredients make their statement too. So I did away with the cashew nuts. Paneer is sold in Indian stores in block form. Make sure that the paneer you buy is on the softer side. I usually buy the brand called "Nanak Paneer". There are plenty of others available but they are all harder. This paneer will melt in your mouth as you chew on it. Cut the paneer into 1/2 inch cubes. On a non stick pan, add 1 1/2 tbsp of oil and roast the paneer in low to medium flame. Once most of the sides are golden brown, turn the heat off. 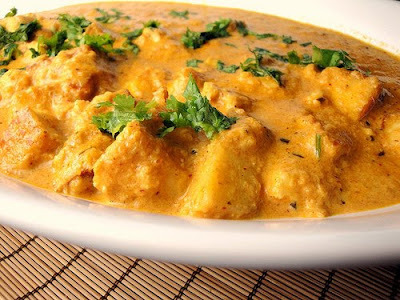 Immerse the paneer in a bowl of warm water with salt to preserve its tenderness while we prepare the gravy. In a pan, add 1 tbsp of oil and saute the onions on low to medium flame until translucent. Add the tomatoes and saute for another 5 minutes. Let them cool off and then blend the onions and tomatoes in a grinder until smooth. In a deep pan/wok, on low flame add 3 tbsp unsalted butter (why would anyone make butter paneer devoid of butter?). Then add the grated garlic and ginger, turmeric powder, cumin powder, coriander powder, cardamom powder, red chili powder, garam masala, dried fenugreek leaves (crush them as you add them) and saute all of this for half a minute. Add the blended onion and tomatoes, 1/2 tsp salt and saute on medium heat for 5 minutes. Drain the water from the paneer, and add the paneer to this. Saute for a couple of minutes and add the heavy cream, followed by the honey. Mix everything together well. Simmer on low heat for 10 minutes. Garnish with the coriander leaves. I would recommend preparing this dish several hours before you serve to enhance its taste. 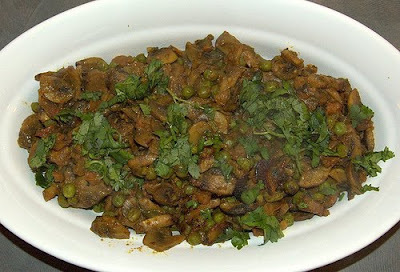 Serve hot with roti, naan or rice, and enjoy this mouth watering dish. Note: Paneer and methi and all of the above ingredients are available at any Indian grocery store. The dry fenugreek leaves come in a big box. You can sprinkle them in any gravy to give it an additional aromatic flavoring.